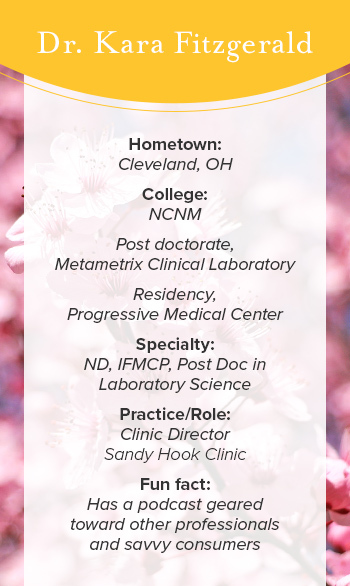 Kara Fitzgerald, ND, IFMCP, is the director of Sandy Hook Clinic, a functional medicine clinic located in Connecticut. She completed her post-doctorate training in nutritional biochemistry and laboratory science at Metametrix Laboratory (now Genova Diagnostics), and a residency at Progressive Medical Center in Atlanta, Georgia. Dr. Fitzgerald is a lecturer at the Institute of Functional Medicine, co-authored and edited Case Studies in Integrative and Functional Medicine, was a contributing author to Laboratory Evaluations for Integrative and Functional Medicine and The Institute for Functional Medicine’s Textbook for Functional Medicine, and is the author of the e-book, Methylation Diet and Lifestyle. She has been published in numerous peer-reviewed journals and blogs regularly for professionals and consumers. In addition, she is on the faculty at The Institute for Functional Medicine. Question: Tell us about Sandy Hook Clinic. Dr. Fitzgerald: The clinic is situated in an amazing location, sitting atop a river, right across from the state forest. We love it here. It’s just exquisitely beautiful, like a treehouse. We find that it really allows us to deliver the best kind of attention to our patients in this setting, which is simultaneously calming and energizing. You’ll find me on site along with Dr. Ken Litwin, an internal medicine MD, who’s transitioning into functional medicine and completed his IFM certification in 2015. I also have a large, virtual nutrition team, with three board certified CNS nutritionists, who are managing patients and actively training others. We have exciting and lively weekly virtual Grand Rounds meetings where we discuss patient cases and new research. Being comfortable in the virtual space, we consult with individuals across the US and abroad over the phone or Skype. Have you found this virtual consultation role as a demand that needed filling, or were you more proactive with that setup? I’ve always offered phone or web-based consultations, which I think originally stems from other physicians or “regular” folk wanting to discuss interpretation of specialized laboratory testing (based on my post-doctoral training.) However, if I don’t see the person in my office first, it’s strictly a consultation--we require that the individual has a local care provider. What have been the challenges and what have been the rewards of incorporating different modalities into your practice? I love working with clinicians of all stripes and specialties who embrace integrative and functional medicine. I’m bringing in a nurse practitioner, and along with the nutrition team I’ve already mentioned, I would say I have an extremely collaborative model. There are often students or clinicians at our practice observing what we do. A goal of mine is to have an ND residency. It’s just a very natural outgrowth of my training. Doing my post-doctorate in a laboratory, I’ve interfaced with a lot of different clinicians, although the majority of physicians I was working with were MDs and DOs. Dr. Litwin has been practicing internal medicine for years. He’s a great doctor, but felt limited by the constraints of the conventional model. Moving to an integrative approach has been a highly rewarding journey for him, I think. I don’t see a major chasm between us (NDs) and our MD peers who are practicing integrative and functional medicine. I just don’t. I’ve been in this space a long time, and I lecture with and collaborate with my MD peers all of the time. I don’t see us as wildly separate. I might have my arms around certain natural interventions more robustly than some of my MD colleagues, but not necessarily so. Many of my MD colleagues have been in this space much longer than I have and are my teachers. Good patient care takes a village. I lean on the smarts of my team, and my greater collegial team of clinicians of all stripes. Now, we all need to be in alignment at this clinic with the basic approach to patient care. Patients first, identifying and treating the root cause, the process of a doctor as teacher, listening to the patient, talking them through how they got to where they are (their timeline) and how we’re going to walk with them out of it. All of us here are rooted in the whole-being, whole-system approach. You maintain quite a presence online, with a lot of content ranging from blog posts to podcasts. What attracts you to that work? It was a carryover from my training at the lab, where I was writing and lecturing for professionals all of the time. We also had laboratory Grand Rounds meetings and various other forms of collegial “think tanks” that I found highly useful and rewarding. I had a blast at the lab and wanted to keep that education-forward model going in my career. Currently, I see patients two days a week, and then the rest of the week is behind-the-scenes stuff, including blogging, podcasting, managing our team and various training work we do, lectures, and so forth. It’s just the process of staying consistent. Don’t do it once and stop. Make sure you do it. You definitely have to manage expectations and do it for yourself, or do it for whoever is going to give you a lot of support for whatever it is you create. I know that feeling of discouragement. “Oh, nobody’s reading it”, or “This sounds so stupid”. I know those voices, but you can choose to continue anyway: forge on regardless because it will be better than you think. You’ve achieved an impressive variety of roles in your career. How do you manage all these roles, let alone engage with each of them successfully? It does get overwhelming. I enthusiastically gallop into all the ideas in this world of mine, but it can get hard to manage everything. A big thing we have to remember as clinicians is that our field is growing extremely rapidly and the interest in what we have to offer is massive. There are many, many opportunities. With that in mind, we have to look for what we’re passionate in, how we want to carry this message and manifest our practices, our purposes. My business has grown because I get excited about a lot of different things and gallop off to go work on manifesting them. For the new practitioner, I would say find what lights your fire and just go towards it. Read more from Dr. Kara Fitzgerald by visiting her website, drkarafitzgerald.com.